Where VolScaler is a user input. To calculate the volume ratio and, if the ratio is above zero it draws it above the bar, otherwise it draws it below the bar. 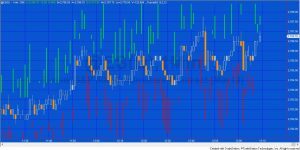 The image on the right shows the program applied to a 1 minute @ES (S&P e-mini) chart. The tutorial demonstrates the drawing of the lines using the TL_New statement. The video below explains the tutorial in great detail.